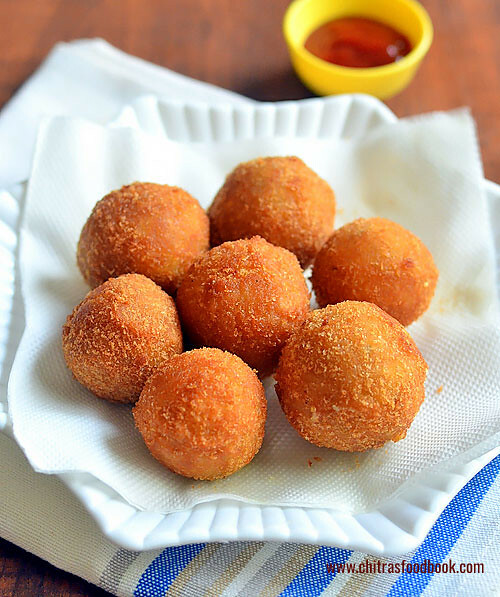 Long back I have shared a recipe for Masala corn cheese balls in which all the spice powders, ginger-garlic paste are used. Its purely of our Indian style with all the masala flavor in it. Its made without potato. Cheese and sweet corn are the major ingredients.I used to make it for my guest and kids parties at home. Recently I came across this video of Corn cheese balls with Oregano & chilli flakes. I got tempted and tried it last Sunday for evening snacks. I followed my Aloo patties( Burger) recipe technique, coated the balls twice in maida paste and bread crumbs to get super crispy exterior. It came out very well. Use Panko crumbs for best result. Raksha liked it very much but she wanted the Indian masala flavor instead of Oregano. Then I made few balls adding garam masala powder .Overall this recipe is a big hit in home. Friends, do try this recipe either with Indian masala or Italian seasoning based on your kids liking. 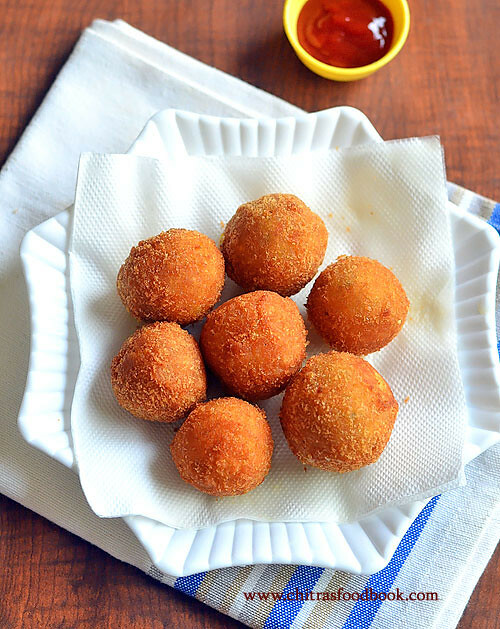 Follow the same procedure and make this yummy, crispy corn cheese balls to celebrate kids birthday party, get together, kitty parties to serve as a starter. The dough can be made in advanced and refrigerated till use. All the kids would easily fall for this cheesy snack . For variations, these balls can be made like nuggets. 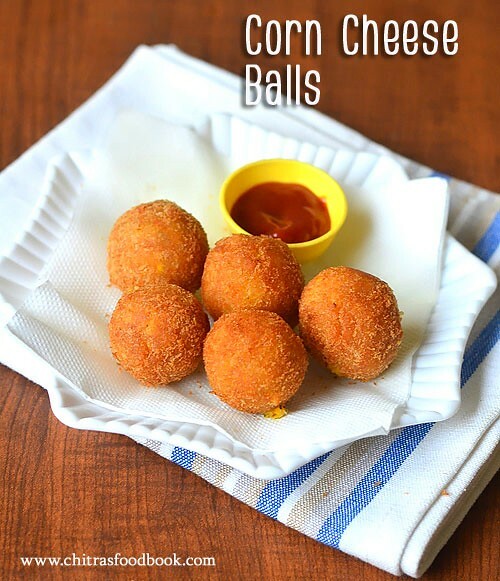 Ok, Lets see how to make this easy corn cheese balls with step by step photos, tips and tricks and a video ! Pressure cook sweet corn and potato adding required water in low flame for 2 whistles. Remove the corn kernels by scraping with a knife. Refer video for more detail. Grind the corn kernels coarsely without adding water. To make homemade breadcrumbs, remove the sides of bread and grind to a fine powder. But use it immediately. Do not store it. Peel the skin of potato. Grate cheese, measure 3/4 cup and keep aside. In a bowl, take the boiled potato, ground sweet corn, grated cheese, chilli flakes, oregano, pepper powder, corn flour and required salt. Mix well and make a smooth dough. Take 2 tbsp maida in a deep plate or bowl and add 1/4 cup water. Mix well without lumps. Take the bread crumbs and spread in a plate. Make small balls out of the dough. Alternatively you can stuff in a small cube of cheese inside the balls. You can try this for kids who want extra cheese. I recommend Amul mozzarella cheese for best results. Dip the ball in maida paste. Then coat in bread crumbs. Again dip the ball in maida paste and roll in bread crumbs. Yes, do it twice. This helps to get super crispy exterior. Use Panko crumbs for perfect crispiness Or you can use powdered cornflakes. I did not refrigerate or freeze the dough. If you wish, you can refrigerate the balls for 30 minutes by covering with a cling wrap. This helps to prevent the cheese from oozing out while deep frying. Heat oil in a kadai and when it gets heated , put the balls and deep fry them. Keep turning and cook in medium flame till balls turn golden in color. Do not fry for long time. Cheese will ooze out. So remove it when the balls turn golden. Do not wait for bubbles to cease completely. Grinding corn kernels is optional. If you like whole sweet corn, add it without grinding. You can use rice flour instead of corn flour. Use cheddar or parmesan cheese instead of mozzarella. You can dip in milk instead of maida paste. Dipping in maida paste and bread crumbs twice is a must to get super crispy exterior. Try it. Instead of bread crumbs, you can use powdered corn flakes. Skip oregano, chilli flakes and use red chilli powder and garam masala powder if you want Indian masala flavor. 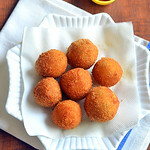 Yummy, crispy corn cheese balls are ready to relish with tomato ketchup !! Perfectly made snack . a treat for kids. Thanks .this will be included in my kids birthday menu.